Our pets are members of our families. It's important that our pets are happy and content at home. In this article, we will introduce you to the 5 best cat tree products for your money. Many people often rush into purchasing the first cat tree they find. However, this technique can sometimes be a careless technique. It's wise to consider the required assembly, quality, sturdiness, comfort, functionality and cost when shopping for the best cat tree. Finally, what is your preference? Do you need a large cat tree? Or a small cat tree? We are here to help you sort through those intricate details! 2. Are You Looking for a Large Cat Tree? So which one is the best for the money? Let's take a look and find out. 5. What Is Our Favorite Cat Tree from This List? 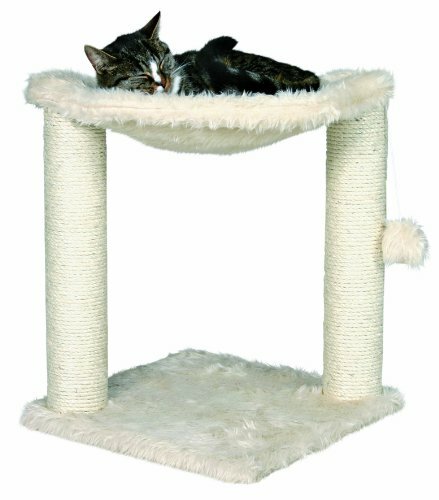 If you are searching for something simplistic yet comfortable, the Trixie Baza Cat Tree would be a great choice for your favorite kitty. This cat tree offers the best of the basics. It's constructed with a simple base board, two scratching posts and a hammock. The base board and hammock are covered in silky, soft, long-haired fabric that are guaranteed to please your kitty. Even further, the hammock is conveniently lined with a metal rim to provide extra support. The two scratching posts are wrapped in sisal material for optimal scratching. Finally, the cat tree comes with a dangling kitty toy for exercise and entertainment. As for the size, this small cat tree has the dimensions of 20L x 16W x 16H. This would make for a great fit in any sized apartment, house, yard, office or wherever your kitty calls home. Obviously, from observing its size, the Trixie Baza Cat Tree is the friendliest on the wallet. Comes with a soft, furry hammock. Sisal rope made from natural materials. The hammock loosens easily for some consumers. If you're searching for a large cat tree, then the Go Pet Club Cat Tree F2040 may be the best choice. Standing at an incredible 72 inches, it has an overall size dimensions of 50W x 26L x 72H. This cat tree is the most majestic of the five products that we will share with you. It comes with two kitty ladders for fun and easy access to the different levels. The six platforms are placed at different heights for comfort, versatility and multiple cats. There are two kitty box houses for comfortable, secure cat naps and two dangling pom pom cat toys for optimal play and exercise. There are a total of ten scratching poles that are wrapped in sisal rope to offer cats a satisfying experience. Even better? The Go Pet Club Cat Tree F2040 is covered in extremely soft, plush fabric that your cat will love. 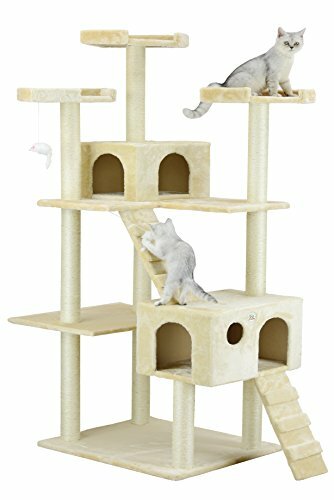 Go Pet Club Cat Tree F2040 - Beige - 72 in. Poor customer service from the manufacturer. Some consumers complained of the fabric having a peculiar smell. 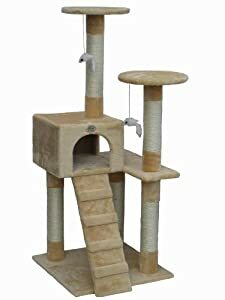 Another option for a great, large cat tree is the Armakat Cat Tree Condo, 70 inch. Standing at just two inches lower than the Go Pet Club Cat Tree, this particular one has a fancier edge to it. Created from pressed wood and covered in soft, faux fur, the Armakat Cat Tree Condo, 70 Inch, skips out on the cat houses. Instead, this version has a plush kitty hammock on the first level and a soft kitty tee-pee on the second level. As for playtime, on the third level, there's a rope that's connected on both ends to the board and arched for easy play and tackle. Dangling from the fourth level is a tiny, fluffy pom pom toy that every cat would enjoy taking swats at. Out of the five cat tree options, the Armakat Cat Tree Condo, 70 Inch, has the biggest cut on your wallet but well worth it. 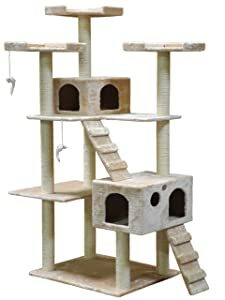 Armakat Cat Tree Condo, 70 Inch. Most expensive out of the five chosen cat trees. Some models have a peculiar smell. Complete with four levels, the Armakat Cat Tree Condo, 57 Inch, is perfect for someone searching for a standard cat tree. It has everything you need to keep your cat happy, healthy and comfortable. It's constructed with pressed wood and covered with soft, faux fleece. The poles are line with sisal rope for easy scratching and climbing. There's a cozy kitty box on the second level and a dangling toy hangs from the bottom of the third level. This package comes with super easy assembly and instructions with a manual and appropriate tools. Easy assembly and includes instruction manual and tools. The string on the dangling, pom pom toy is dangerously too long on some models. 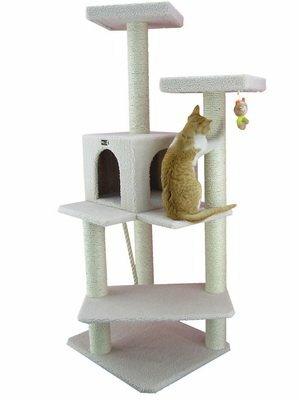 The Go Pet Club Cat Tree, 52 Inch, is the most affordable of the four level cat trees. Designed for medium sized cats, it has a cozy cat house on the second level. A fun ladder leads to the cat house entrance. The two dangling toys from the third and fourth levels create loads of fun and exercise for the cat. With five sisal roped poles, there's plenty of scratching posts for the kitty and his friends. 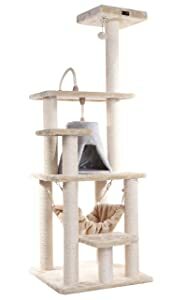 The Go Pet Club Cat Tree, 52 Inch, is constructed with pressed wood, soft, faux fur and durable sisal rope. Just like the Armakat Cat Tree Condo, 57 Inch, it also conveniently comes with the assembly tools. 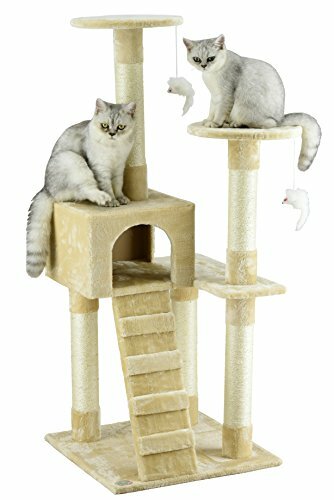 Go Pet Club Cat Tree, 52 Inch. According to consumers, breaks easily. Isn't big enough for large, adult cats. If you're trying to choose a cat tree from our list, it's important to keep your specific situation in mind. Are you shopping for one cat? Two? Three? How heavy is your cat? How light is your cat? Once again, this is a major detail to determine before you make a decision on which cat tree is the best for you. These are some of the big questions we will cover in this section of the article. Remember, it's our goal to help you make an informed decision on the best cat tree. -If you're shopping for one small cat, the Trixie Baza Cat Tree may satisfy you completely. It comes with one dangling, pom pom toy, two sisal rope poles for easy scratching and a soft, long-hair hammock. However, when you compare the price to that of the three leveled Go Pet Club Cat Tree, 52 Inch, it would be worth it to spend the few extra dollars for much more. Then again, this would depend on your specific situation. Would you have the space for a 52 inch cat tree? If so, this would be the better deal over the small Trixie Baza Cat Tree. The Trixie Baza Cat Tree doesn't have a kitty house but a soft, long-haired hammock. The Go Pet Club Cat Tree, 52 Inch, does not have a hammock but has one kitty house and a ladder with two pom pom toys. Which is better for your wallet in your specific situation? -The Go Pet Club Cat Tree F2040 and the Armakat Cat Tree Condo, 70 Inch, are the most expensive cat tree options in this article. Why? They are the largest and highest of the five cat trees. 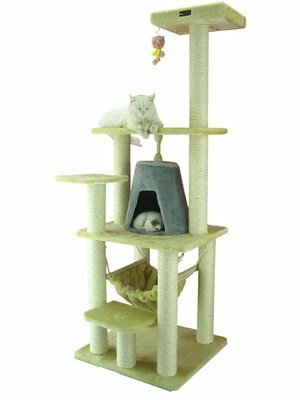 The Go Pet Club Cat Tree F2040 comes with two kitty houses, two ladders, two pom pom toys and ten sisal rope scratching poles. The Armakat Cat Tree Condo, 70 Inch, comes with one hammock, one tee-pee, one pom pom toy, one arched play rope and ten scratching poles. Clearly, the Go Pet Club Cat Tree F2040 has more to offer. However, the Armakat has unique options that the Go Pet Club Cat Tree F2040 does NOT have. The hammock and tee-pee are unusual and stand out from the norm. For many customers, this alone is worth more than the other. If you find yourself torn between the options, take a deeper look into the quality of the cat trees. After reviewing their pros and cons, it's clear that they both have issues with having peculiar smells. However, the Go Pet Club Cat Tree F2040, has been reported to have poor customer service. Should you find yourself needing to exchange the Go Pet Club Cat Tree F2040, their customer service department may not be a pleasant experience according to past consumers. In this case, we would recommend the Armakat Cat Tree, 70 Inch. If you wouldn't expect to deal with customer service, then our recommendation would be the Go Pet Club Cat Tree F2040. After careful review of the cat tree products, we award the overall winner to the Go Pet club Cat Tree F2040. It comes with everything! As already discussed, the Go Pet Club Cat Tree F2040 offers it all. With the two cat houses, two ladders, two dangling, pom pom cat toys, five levels, ten scratching poles and more! This would be every cat's dream. It even holds up to 50 pounds! The sturdier the cat tree, the more reliable it is and the longer it will last. Even better? It isn't the most expensive cat tree on the list! Our second runner up choice would have to be the simplistic Trixie Baza Cat Tree. Let's face it: for customers that live in a small apartment and have one cat, this would be perfect. It is available for a great, affordable price, created with the softest materials and comes with two sisal rope scratching posts, one dangling, pom pom toy and a silky, soft, long-haired hammock. These five chosen cat trees are some of the best on the market. Regardless of which one you choose, all of them are constructed from high quality materials and fabrics. Each one is uniquely its own in that one offers something that the other doesn't. All of the cat trees offer the sisal rope covering on their scratching poles. Is the smallest of the cat trees with two levels. Easy assembly and instruction manual and tools are included with the package. Stands the tallest at 72 inches. Built for medium sized cats. Holds and supports 50 pounds. Now that you know all that there is to know about these five cat trees, it's up to you to decide on which one works the best for you and your situation. We hope the information provided has helped you to make an informed decision in your cat tree search for the best. Happy Shopping!